Paris-born, Berlin-based artist Cyprien Gaillard could be described as an archaeologist of recent history. In his films, photographs, collages, sculptures and performances, the Sublime sits alongside the profane, and brutality is underscored by moments of quiet beauty. Jonathan Griffin: Where is wilderness today and how do you value it? Cyprien Gaillard: My father was a fly fisherman. He would take me on trips to a river in Oregon, and I would spend my time looking for a parking lot or road so I could skateboard. I think my early relationship to architecture was informed by that. About a year ago, I was travelling across the Ukraine and visited Chernobyl, which the authorities no longer consider to be radioactive. Pripyat, the amazing modern city where the workers used to live, is now totally wild; there are trees on the roofs of 20-storey buildings. Nature has taken over. You can walk all around it, but you have to stay on the concrete; the guide tells you not to go between the trees, because they retain the radioactivity. The only place you can’t access is the wilderness surrounding the city. I spend nearly all of my time in cities, even when I’m travelling; I rarely go to the countryside, although lately I’ve been spending a lot of time in golf courses – they’re the new parks, landscapes with romantic potential. JG Where is the romantic potential? CG A landscape grows out of the idea of the picturesque, a term that historically refers to a landscape that it was thought deserved to be painted. In the 18th century, this would always be a rough place, perhaps with broken columns or a dark sky. I find this kind of tension in places such as golf courses; behind their peacefulness is the violence of keeping them heavily landscaped. JG Is your relationship to romanticism an uneasy one? You have spoken in the past of not wanting to ‘fall for’ romanticism. CG With all the other career options one has in this world, choosing to be an artist is romantic. When I refer to not being romantic it’s because I don’t want to simply contemplate a landscape. I try to interact with it, not simply make a representation of it. I’d much rather be a romantic urban planner, for example, than a romantic artist. JG That seems to me to be at the core of a romantic relationship to landscape – the artist going out into the world to reduce their objective distance. CG That’s true. Like in Michael Heizer’s earth work Double Negative (1969–70), for which he exploded part of a cliff with dynamite. It seems so macho now, but to use oneself as a scale against which to measure landscape is a very romantic gesture. JG How do you see your role? Are you an agitator, an archivist or a cultural historian? CG I am much more a field artist. I look at things in the state they’re in now and try to make something new. JG Throughout your work, there seems to be a tension between an interest in the self, and the disintegration of the self – oblivion. CG Yes, absolutely. Last summer I went to Angkor Wat in Cambodia. On my first day there, I wasn’t so interested in the ruins and found myself that evening in a bar, drinking Angkor beer. I asked the bartender about it, and he said: ‘Drink the beer, and tomorrow you’ll feel like the ruins; they’ll be more than just a tourist attraction.’ So, the next day I visited the ruins really hungover, and suddenly got the full picture of the site and was able to relate to it. Alcohol and architecture have always been, to me, closely linked. There used to be this tradition in England called the ‘topping out ceremony’: when a building was finished, the contractors drank pints of beer together on the top floor. This also reminds me of a recent article about the real estate crisis on Spain’s Mediterranean coast. It said: ‘After 20 years of partying Spain wakes up with a hangover.’ I thought it was really well put; partying as a metaphor for bad urban planning and a city in ruins being the hangover. Most people see these tower blocks as monumental and dehumanized, but in the end they raise this universal question about inheritance; each generation takes the city as the previous one transmitted it. I find this quiet discourse about heritage and legacy really interesting and beautiful. JG This is an inevitably entropic and anti-progressive position to take. Do you believe in the possibility of progress at all? CG Not these days. I think things are only going to deteriorate. For me, my film Cities of Gold and Mirrors (2009) is about this. Cancun, in Mexico, is like Benidorm in Spain; an example of the degradation that you find in humans and in a landscape. For many teenagers their trip to Cancun is their first trip outside of America; they couldn’t find it on a map. They come back after a week of binge drinking, and the Mayan architecture is just a blur, soaked into alcohol. JG Cities of Gold and Mirrors – in which you contrast images of these Mayan ruins with American frat boys downing bottles of spirits – seems to take a more explicit moral position than previous works. CG But I also found myself partying in Cancun. I went there three times before I started filming; I could never have had these ideas if I hadn’t found myself in a state of near-total destruction. When I went to Niagara Falls, to shoot part of Pruitt Igoe Falls (2008), I arrived during the day, from the American side of the river, which is kind of pure and undeveloped. For the best viewpoint however you have to go to Canada, across the river. Niagara Falls City on the Canadian side is very rich, with skyscrapers, casinos, strip clubs and hotels overlooking the Falls. When the sun sets, the entire Falls are lit from the Canadian side; huge spots slowly change colour; it looks like a gigantic cocktail. It’s like a celebration of the failure to preserve this natural wonder of the world. The whole thing is a disaster! But most people go there on their honeymoon, they just love the Falls, they think they’re beautiful and romantic. JG Is that why you reject narrative, because it is about a contemporary moment, an instant? CG Yes. I don’t want to build another form of narrative in a landscape that is already so rich. Adding something else would be silly. JG For your recent project Dune Park (2009) you did the opposite: you removed sand to reveal a buried German military bunker. CG I thought it would be interesting to treat a bunker as a classical ruin, or a temple buried beneath the desert in Egypt; to conduct a modern excavation, using Caterpillars, not brushes. JG That gesture has a kind of psychic potency. Does psychoanalysis influence your work at all? CG I don’t think about psychoanalysis very much. I think it is simpler than that. I see buildings falling in Glasgow, I see rubble, I ask myself where that rubble goes. I discover that it’s crushed and then used to build new pedestrian streets – so people are walking on the ghosts of tower blocks. It reminds me that, in Egypt, before Giza was considered as an archaeological site, it was just a building quarry. People would take the rocks from the pyramids to build sidewalks and houses in Cairo. So these Modernist tower blocks are the new quarries, in a way. JG In the 18th and 19th centuries, ruins were added to landscapes in order to provide a thrill of horror at decay and degradation. 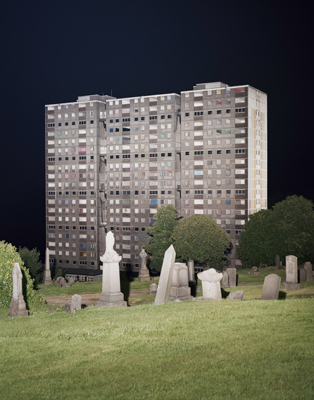 Do you think that there is a danger that images associated with working class culture today can become part of a contemporary picturesque? CG Obviously, as you say, the buildings I use in my work belong to the history of working class, and the communities who occupied them, but when you have a building that has been abandoned for years, it is reclaimed by the landscape. It somehow has a life of its own after that. For me, the change is never from a working class to a bourgeois context; it is from one landscape to another. JG In the past you have acknowledged the politically obscuring power of the spectacle, and your ambition to reclaim it. How does your reclamation change it? Does it just create an alternative spectacle? CG In France we have a tradition of rioting, a revolutionary history or, you might say, revolutionary vandalism, from the Bastille being torn down to public bus shelters and police stations being burned during the 2005 riots. All these examples of revolution are of people attacking state buildings or the architecture of authority. But we have a situation now where the state builds these structures and then pulls them down. It is an anti-revolutionary situation in a way, a form of state vandalism, but is also very Machiavellian. The building falls and everyone is encompassed in a cloud of dust and ends up cheering: the spectacle of it justifies everything. This act of destruction manages to put into perspective all other forms of public vandalism such as burning a car or graffiti. This is why I want to reclaim it as my own; not necessarily as an artist, but as an individual within society. If this is all going to be destroyed then I want my fair share; I don’t want to be a victim of it. I think that it should always be one of the people who lived in the building who gets to dynamite it. It should never be an official, faceless, white-collar act of destruction. JG What happens, then, when you create a performance event, as in Performa 09 or in the Turbine Hall of Tate Modern last year? It seems with those events you are involving and implicating the audience to an increased degree. CG Well, this is truly re-appropriating, I guess. It is kind of restaging the demolition, relocating it. JG So is that about sharing or is it about you? CG It is about me reclaiming it as my own. JG And demonstrating that to others. CG I’m very much aware that in my practice I am also going to these places, witnessing these things that most people aren’t able to go and see. JG What does music bring to the work? You have collaborated many times with the musician Koudlam. CG We worked closely together to create the music for my film Desniansky Raion (2007), which combines footage of a huge gang fight with images of tower blocks in Belgrade and Kiev. I wanted the kind of music that you find in National Geographic documentaries – imitating traditional Mayan music, for instance, but made on synthesizers by Europeans. JG But is there also a sense that music is aestheticizing this material – making it more seductive? CG It is, but it’s also about making the work more precise. It gives an anachronistic quality to the work, operating as a kind of distortion of time and space. It is both electronic and tropical. I consider it entropic music. JG Is there a streak of irony running through your work? CG I always go through a phase of irony – it is important to question what you are looking at – but once I fully understand a place I overcome irony and appreciate it. In the end my relation to these landscapes is always sincere. I love Niagara Falls in the state that it is now; it has never been this beautiful. I would never be the one to say, ‘oh, turn the lights off’.